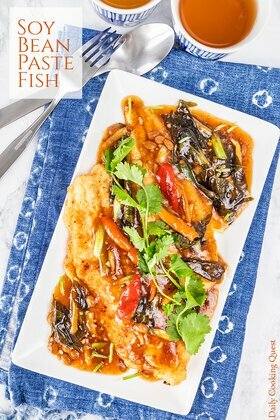 When you are busy but crave for an easy pan-fried fish with a simple sweet and sour sauce, look no further than this recipe for pan-fried fish with Thai sweet chili sauce. 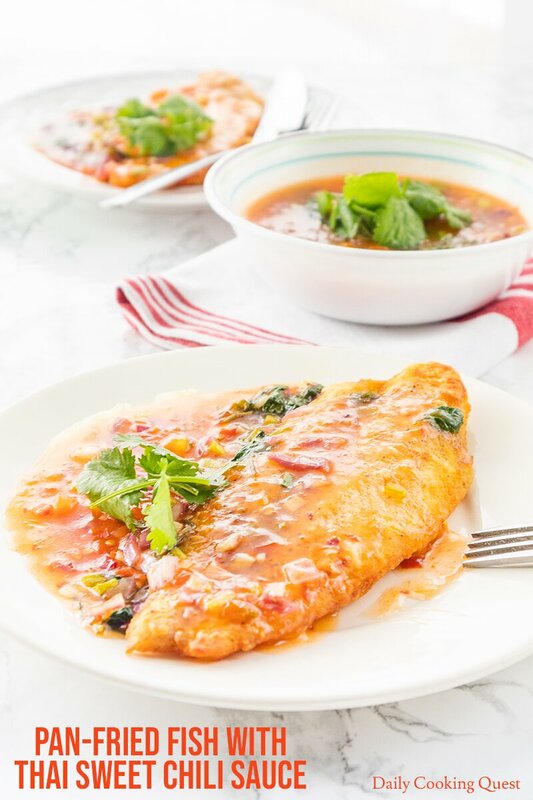 It should take about 30 minutes from start to finish to prepare this dish, including pan frying some fish fillet, and preparing the delicious sauce. If you are like me, you will want to make this sauce again and again and pair it with just about anything. 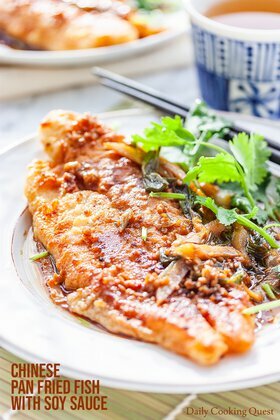 To prepare pan-fried fish fillet, you can use any kind of fish with white firm flesh. The cheapest and most widely available fish fillet is tilapia. For a slightly more expansive choice, you can try swai or rock fish. For a more all out fine dining experience, or when you are feeling fancy, you can also use red snapper, cod, or halibut. Depending on the fish fillet thickness, the pan frying time may differ slightly. Just to be clear, the cooking time in the recipe has been tested on tilapia, swai, and rock fish. Along with garlic, onion, tomato, salt, and sugar. This sauce is similar to sweet and sour sauce, but with a spicy kick. I think this version of sweet and sour sauce is also so much easier to prepare compared to traditional sweet and sour sauce. Like any good sweet and sour sauce, if you happen to like this sauce, feel free to use it with chicken, pork, or even tofu. Originally published on November 23, 2015. 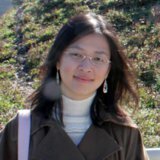 Updated on April 1, 2019 with new photos. Sprinkle fish fillet with salt and pepper, then coat with flour. Heat 2 tablespoon oil in a frying pan on medium high and pan fry fish fillets until golden brown on both sides, about 2 minutes per side. Set aside in a serving plate. Heat about 2 tablespoon oil in a frying pan (use the same unwashed pan to fry fish) on medium high heat and sauté garlic and onion until fragrant, about 3 minutes. Add tomato. Mix well, and cook for another minute. 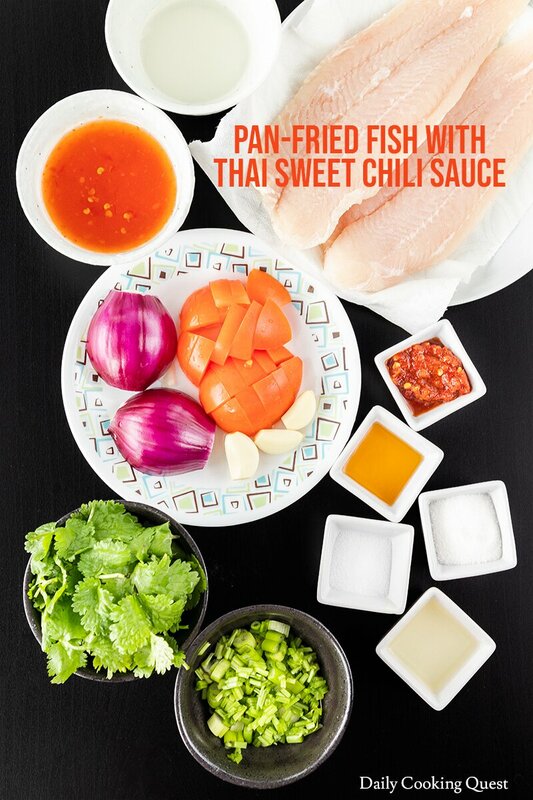 Add Thai sweet chili sauce, water, chili sauce, vinegar, fish sauce, salt, and sugar. Mix well. Bring to a boil. Adjust taste as needed. Thicken sauce with cornstarch solution. Turn off heat once the sauce has thickened. Add chopped cilantro and scallions into the sauce. Mix well. Pour the sauce over the fried fish. Serve immediately. Very tasty sauce! I was looking for something nice and tangy with a little kick. I fried some snapper and it was great and hit the spot perfectly! Thanks! I love snapper too, especially red snapper. I'm glad you love this recipe Phyllis. 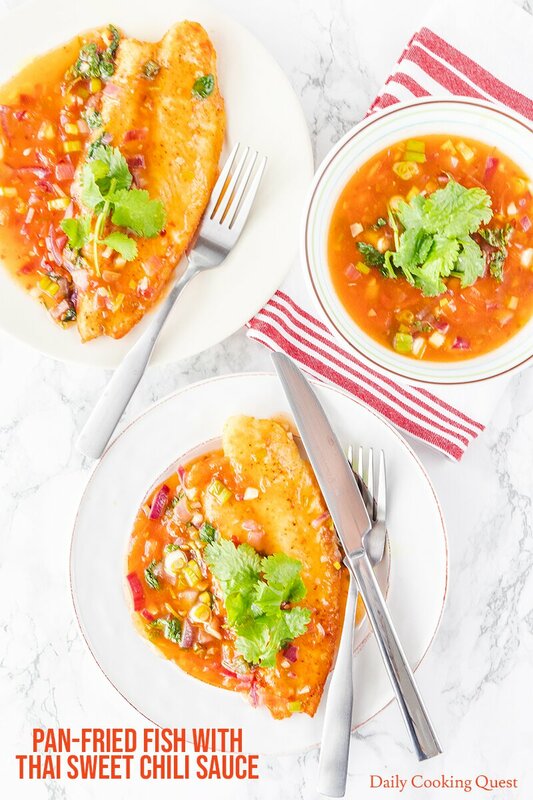 Red snapper is my absolute favorite fish and would be so perfect in this recipe! Oh that Thai sweet chili sauce sounds so perfect!!! This looks absolutely delicious. 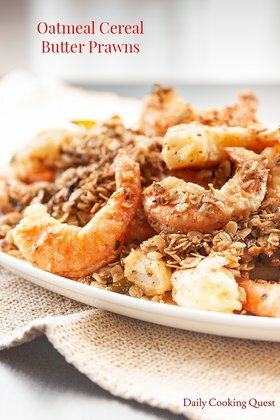 My family loves fish and spicy food so I'll have to make this. Wow, this is such a beautiful dish! I love the sweet chili sauce with it - such a great combination of flavours. I love the sound of that Thai sweet chili sauce! I usually just use it straight from the jar, but I love all your tasty additions!